The National Palace Museum (in Chinese 國立故宮博物院) is one of the largest museum in the world which houses a large number of Chinese cultural artifacts and artworks from the Song, Yuan, Ming and Qing imperial courts. The National Palace Museum (NPM) was founded in 1925 in the Forbidden City in Beijing. Due to the impending Japanese invasion and the civil war between the Nationalist government and the Communists, the Republic of China shipped about 600,000 of the most precious objects in the collection to Taiwan. Most of the collections are high quality pieces collected by Chinese's emperors with over 8,000 years of Chinese history. The most popular exhibit item that attracts many visitors to admire at, is the Jadeite Cabbage. The National Palace Museum is always crowded with individual visitors as well as tour groups. Hence, you should make a trip early in the morning to get there. As soon as you walk into the museum, you should head to the top floor and start your tour from there before heading down to the ground floor. Most of the famous exhibit items are located on the top floor where you must queue first, before getting into the exhibition room. Film and photography is prohibited in the museum as it is the policy to protect the antique collections such as paintings, books etc. It takes at least half of your day to visit all the exhibition so, plan accordingly to allow yourself to have ample time to enjoy viewing the antique collection and watching the multimedia presentation. The museum also exhibits special theme once a while. I was lucky to have the opportunity to view Qianlong's collections, paintings, poems, writing etc. at "The All Complete Qianlong" exhibition. The Qianlong emperor was endowed with great intelligence who loved to learn more due to his thirst of knowledge and curiosity. Qianlong emperor also admired and appreciated the arts and literacy to the extend, he carried along his favourite collections when he traveled outside of the palace. 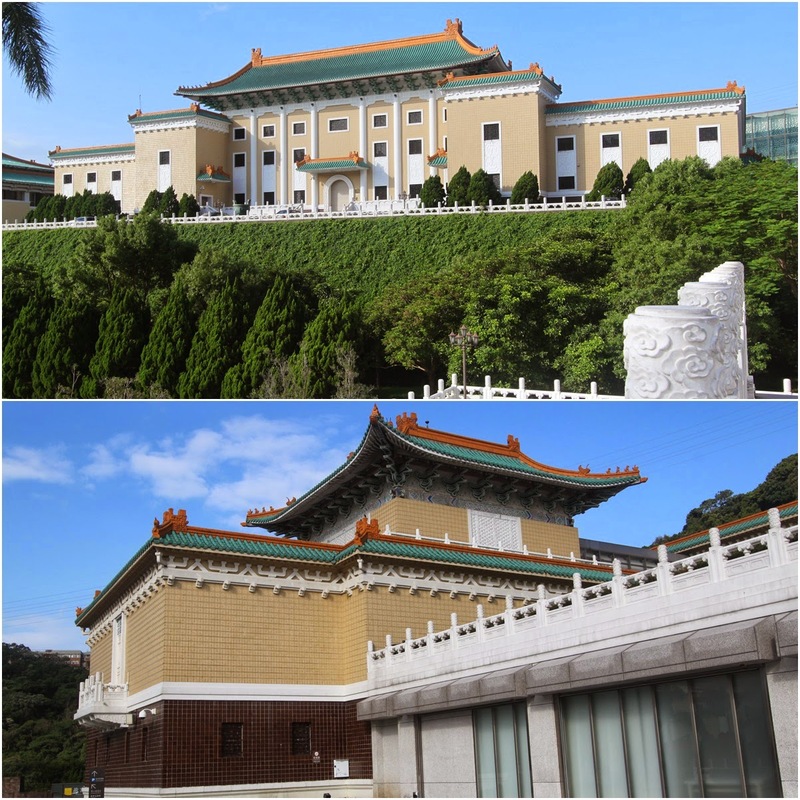 The National Palace Museum opens every day from 8:30am until 6pm. The ticket entrance fees at NTD160 per person, can be purchased at the ticket booth, located at the entrance of the main building of the museum. Large bags and luggage are not allowed in the museum. You can keep your large bags and luggage at the bag storage booth, located next to the entrance where the authorities collect and check your ticket before entering the museum. Take MRT Danshui (red) Line to Shilin Station (Exit 1). Then, board minibus 18, minibus 19, red 30 bus, No. 255 bus or No. 304 bus to National Palace Museum. Otherwise, for more convenient, you can take a local taxi (cab) from Shilin Station. The taxi fare costs about TWD150 for one way and arrives within 5 minutes to the museum.